Created by the Museum's gifted and committed docents, this cookbook is a compilation of recipes contributed by staff, docents and volunteers of the Museum. It presents an outstanding collection of recipes that include some of the best dishes of the Southwest as well as delicious traditional offerings. Recipes range from tasty cold soups, like gazpacho, to tantalizing appetizers, like stuffed mushrooms, to regional entrees and dishes that incorporate native foods, like mesquite rolls and nopalitos. In addition, tidbits of information about the Sonoran Desert and the Desert Museum provide fun facts like how to make a tasty drink for visiting hummingbirds and how to make rich compost fertilizers for garden plants. 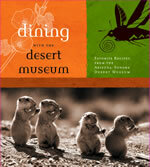 This book is a must-have for the complete Southwestern kitchen.